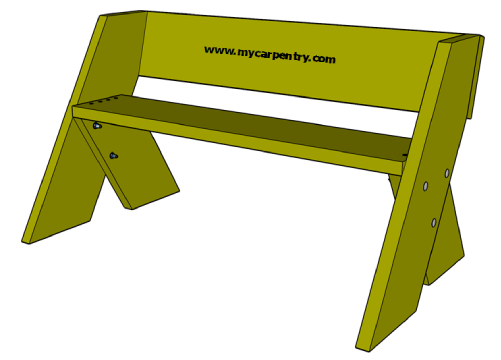 These easy bench plans were inspired by a bench I spotted while hiking in a park. A reader recently informed me that this bench was invented by an American conservationist and environmentalist named, Aldo Leopold. I was so intrigued by its functional simplicity, I just had to build one myself. I have seen several variations of the Aldo Leopold bench (some taller, some wider, etc. ), but I liked the dimensions on this one the best. 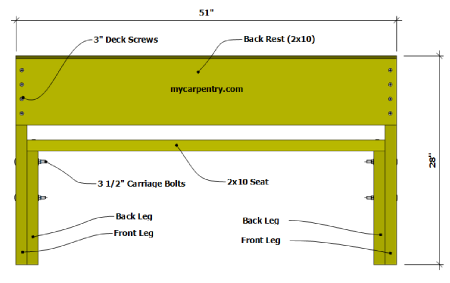 The entire bench is made of 2 x 10 material. 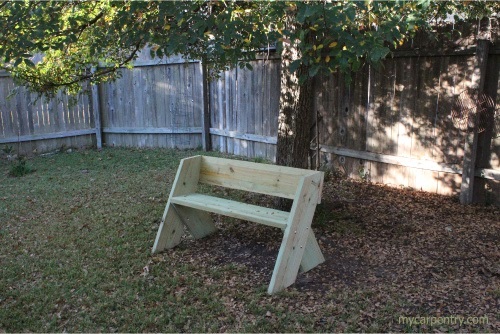 You can use any species of wood to build this bench, but if you are intending it for outdoor use, I recommend a material that is resistant to decay, like Cedar, Redwood or Pressure Treated pine. With a speed-square or similar tool, mark a 30 degree angle near the end of one of the 2x10s (this will result in a 60 degree angle on the 2x10). Cut it with a circular saw. Measure along the edge of the 2x10, 33 inches from the long point of the first angle and mark another 30 degree angle. This angle should be parallel to the first angle. Cut it and use it as a template for the other leg. These are the front legs of the bench. (see side view diagrams). Measure 8 inches from the top end of one of the front legs and mark a 15 degree angle (this leaves a 75 degree angle on the back support/front leg). Cut it with your circular saw. 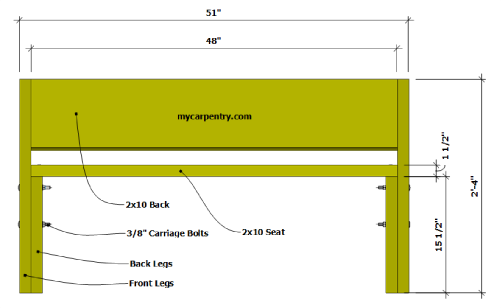 This is the angle of the back rest (see side view diagram). Repeat this procedure on the other front leg. From the same piece of 2x10, measure 18 inches from the long point of the last 30 degree angle that was cut from it. Mark another 30 degree angle and cut. This is the back leg support. Use it as a template for the other back leg. 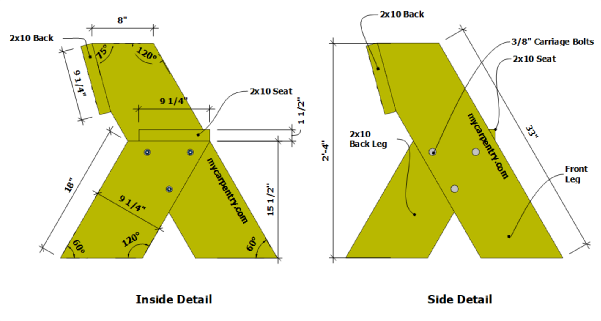 Align the front support and back leg support as shown in the diagram and temporarily secure the two pieces together with 'C' clamps. Mark the holes for the carriage bolts by measuring 1.5 inches from the edge of all overlapping surfaces, forming a triangle. Drill 3/8 inch holes through both pieces and secure with three carriage bolts, washers and nuts. Repeat this process on the other upright and back leg support, keeping in mind that the two back leg supports must be on the inside of the two sides of the bench. From the second 2x10, square off one end and cut it to make sure that the end is perfectly square. Measure 48 inches and cut it to length. This is the seat of the bench. From the remaining piece of 2x10, measure 51 inches and cut it square. This is the back rest of the bench. We hope you enjoy building this Aldo Leopold bench project as much as we did. Sometimes the simplest projects provide the most value.